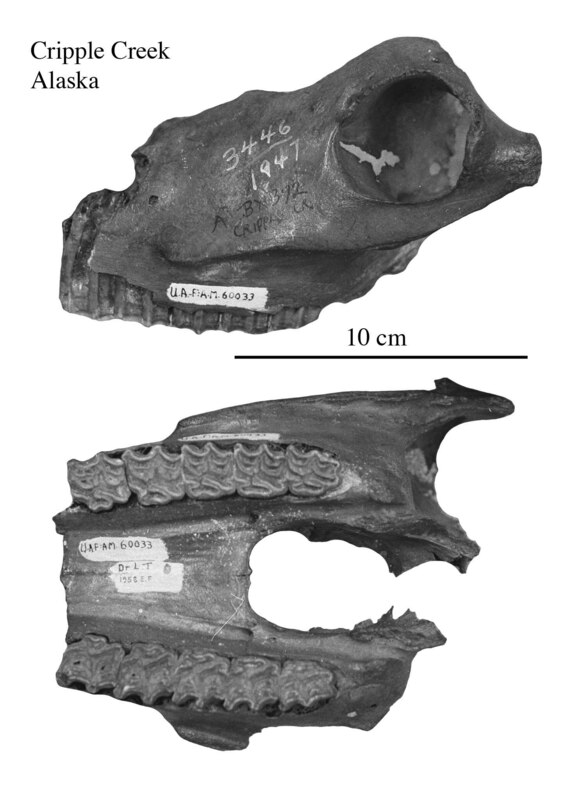 Amerhippus leoni and "Equus conversidens"
The type upper cheek teeth of E. conversidens Owen 1869 figured correctly by Hibbard (1955) are so close in morphology to those usually referred to E. semiplicatus (Fig.1) that one may wonder if they do not belong to the same species. 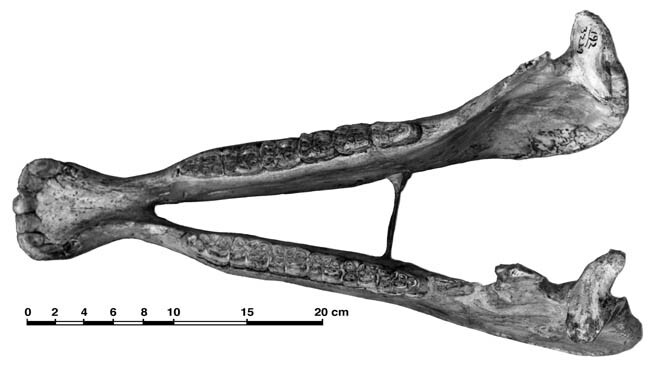 Since there are no associated lower cheek teeth or limb bones it would seem safer to leave this type alone and deal with better documented fossils referrable to "E. conversidens" but with another name. I think, however, that when a name is so widely used, it is rather confusing to abandon it completely. 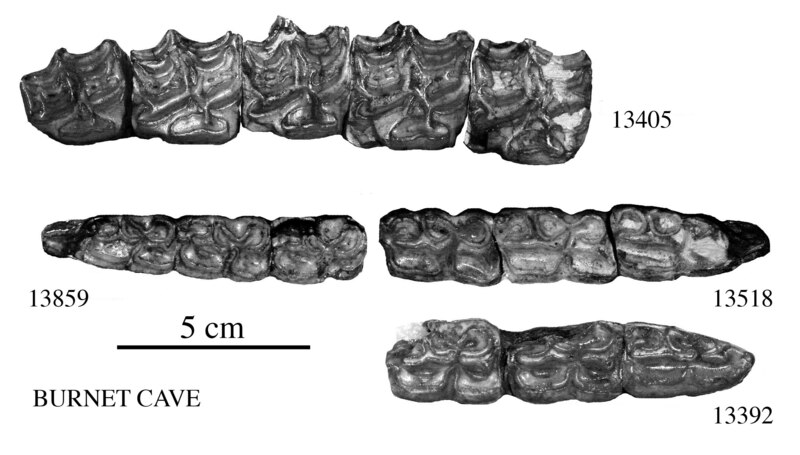 I shall refer to "E. conversidens" poorly documented fossils (like isolated cheek teeth or series) and try to be more precise when the material is better, in particular when there are good reasons to suppose that they belong to Amerhippus rather than Equus. The type comes from Naphta mine, Tepeyac Mountain, near Guadelupe (Mooser & Dalquest, 1975, p.791). 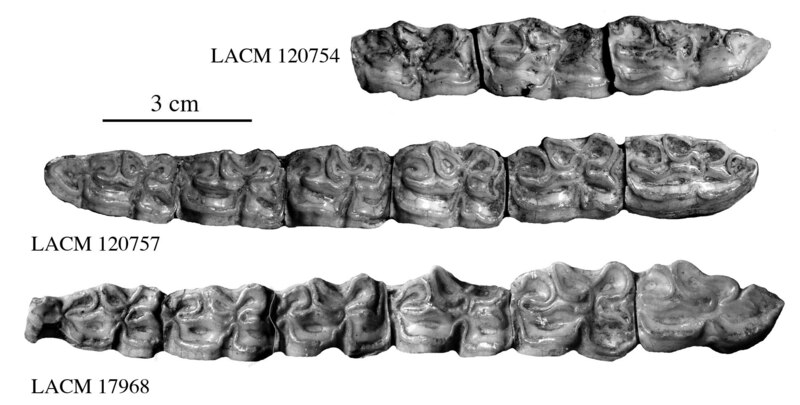 Compared to other "E. conversidens" upper cheek teeth series, the type is rather small (Fig.2). Unfortunately there are no metapodials associated with the type. Detailed data on the Fig.2 histograms may be found in the Appendix (Fig.A1 to A4). First I shall address one of the best documented fossils i.e. "E. conversidens leoni" Chester Stock 1953 from San Josecito Cave (Southern Nuevo Leon, Mexico). I propose to refer to it rather as Amerhippus leoni. Some other fossils for which there is evidence that they belong to Amerhippus will be referred to as A. cf. leoni. 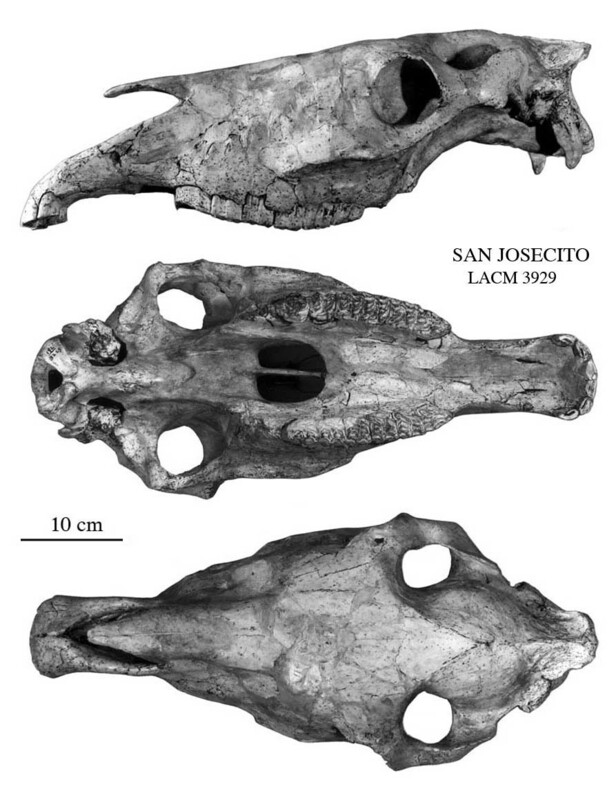 Photographs of the type skull (Fig.3,4) were kindly provided by Arroyo Cabrales and Johnson from an unfortunately unpublished article. 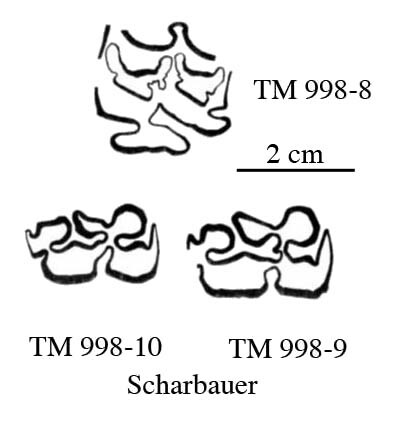 Although not perfectly preserved, the type cranium, another one, and two fragments (Table 1) provide enough information to draw a Simpson’s diagram (Fig.5). On the same diagram are plotted the measurements taken on photographs published by Azzaroli (1998) of a skull from Baranca del Muerto, Mexico, and the measurements of the best preserved cranium from Papago Springs (Table 1, Fig.6,7). The Papago Springs specimen and that of Baranca are smaller but do not seem very different in proportions. On most dispersion diagrams (not illustrated here) used to characterize Amerhippines Amerhippus and Caballines : Cranial differences the proportions are similar enough to justify the attribution to Amerhippus. I refer the equids of Baranca del Muerto and Papago Springs to A. cf. leoni. They are not very different from those referred to E. semiplicatus (Fig.1), although in general smaller and with shorter protocones. 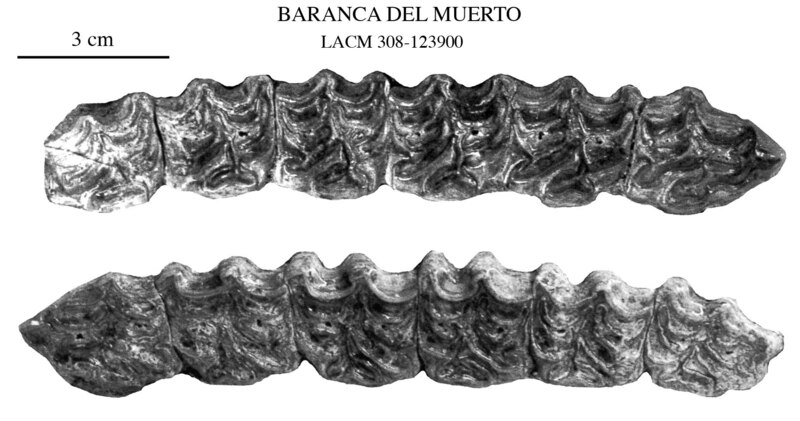 Those of Baranca del Muerto (Fig.9) and Papago Springs are very similar (Fig.10). One P2 has a pli protostylid, an Amerhippine character. 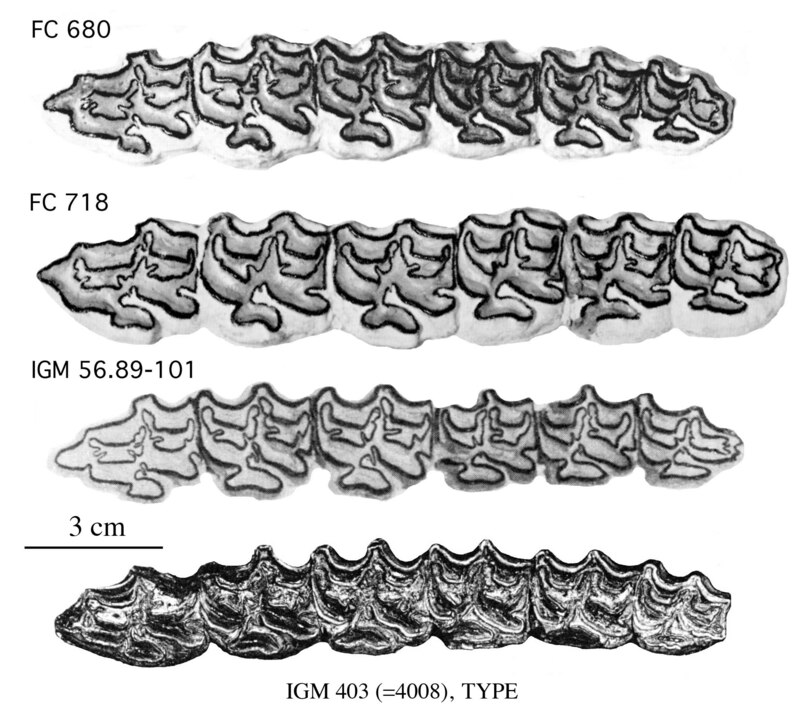 The premolars resemble those of some extant zebras : pointed metastylid, rounded metaconid. 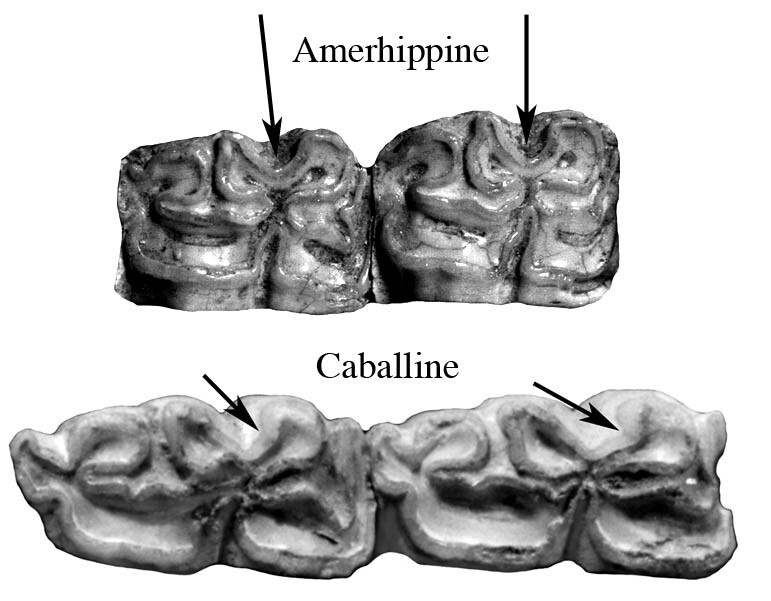 The molars have shallow vestibular grooves, pointed metastylids, and U-shaped lingual grooves but without the lingual angulation of the metaconid characteristic of Caballines (Fig.12). Plis caballinid are absent or poorly developed ; protoconids and hypoconids have more rounded vestibular walls than usual in Caballines. 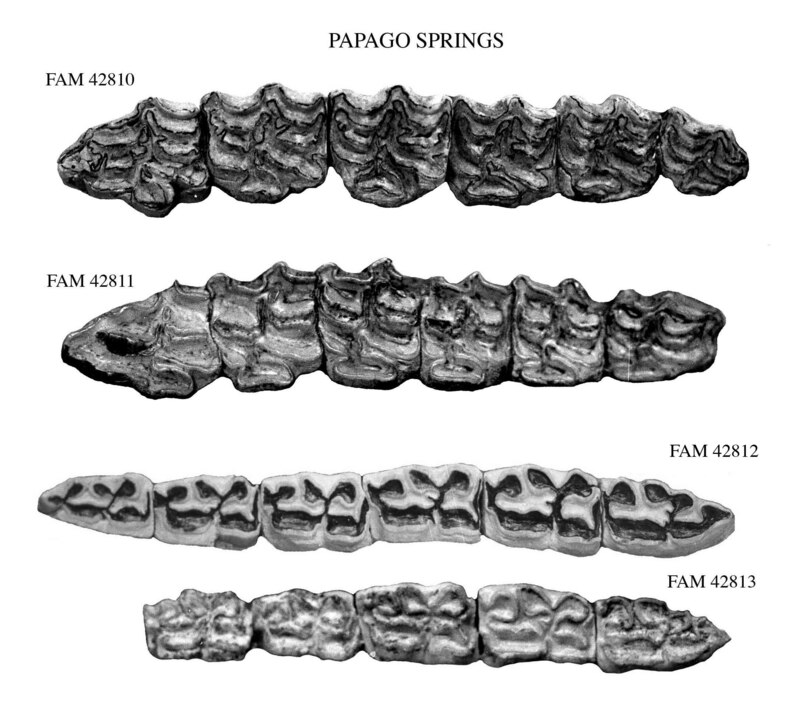 I refer the lower cheek teeth of Papago Springs illustrated on Fig.10 to A. cf. leoni. As usual in Amerhippus, they have no cups. 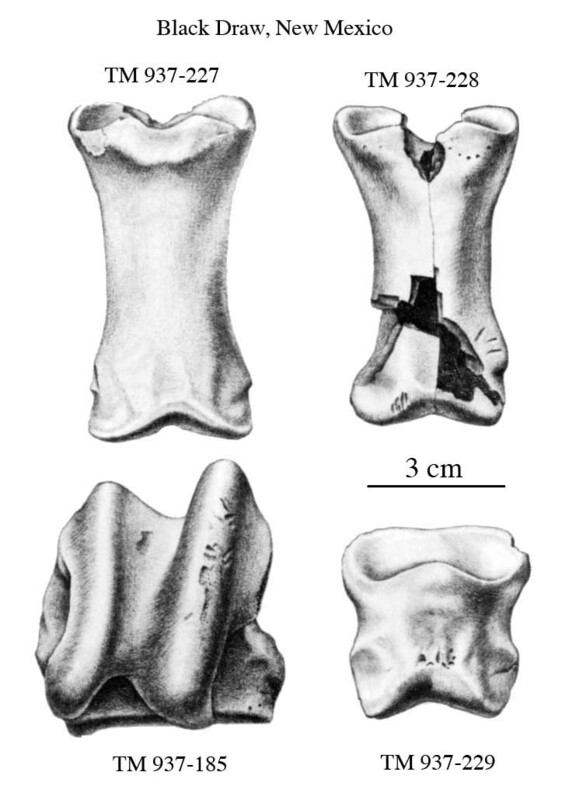 Although smaller, the third metacarpals are surprisingly similar to those of A. occidentalis from Rancho La Brea (Fig.14). The single MC of Papago Springs published by Skinner (1942) is even smaller. The MT differ more from A. occidentalis (Fig.15). The first phalanges Ph1 anterior and posterior resemble some extant Asses (Fig.16). Proportions of limb bones (Fig.17) are similar to A. occidentalis, to the extant E. zebra, and to what is known of the Papago Springs equid. Several specimens figured by Mooser (1959) and Mooser & Dalquest (1975) can be refered to "E. conversidens". Since there are none associated to the type, their reference is based on resemblances with A. leoni (Fig.11). The same is true for the MC and MT. 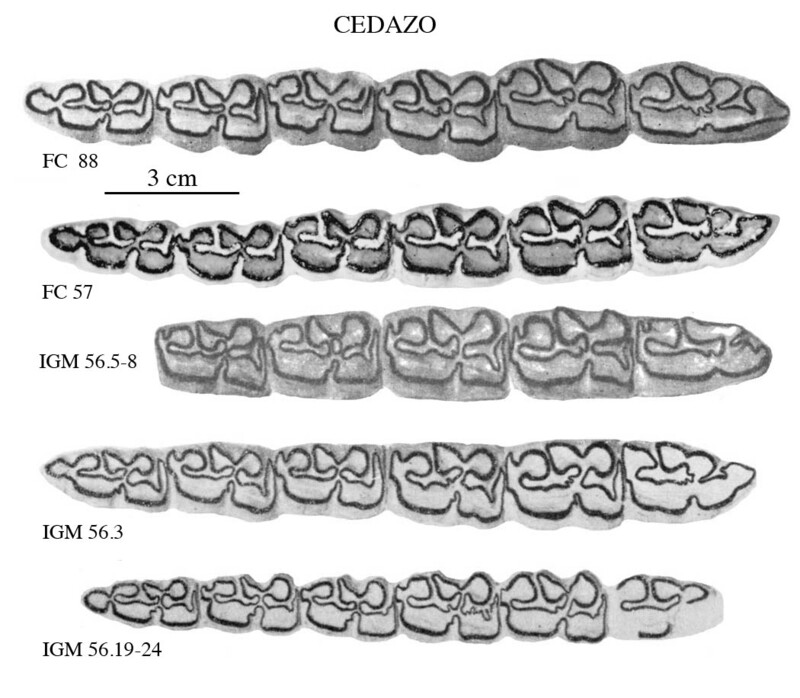 The type upper cheek teeth (Fig.21) resemble some from Cedazo. The metacarpal is slenderer than in A. leoni ; there is one MC from the Irvingtonian locality V 3604 (at Berkeley) very similar (Fig.22). The MT is compatible with A. leoni. Thanks to Dr Ted Daeschler and Mario Pichardo, I had access to photographs of the fossils represented on Fig.23 and 24. 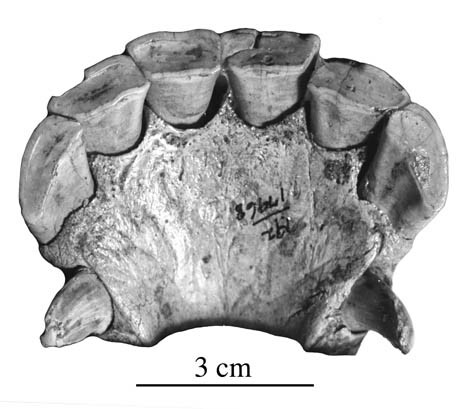 The teeth are similar to "E. conversidens" although rather large. The metapodials are, however, much slenderer (Fig.25) so that there seems to be a discrepancy between teeth and metapodials (Fig.2). The MC is smaller but similat to E. nevadanus. 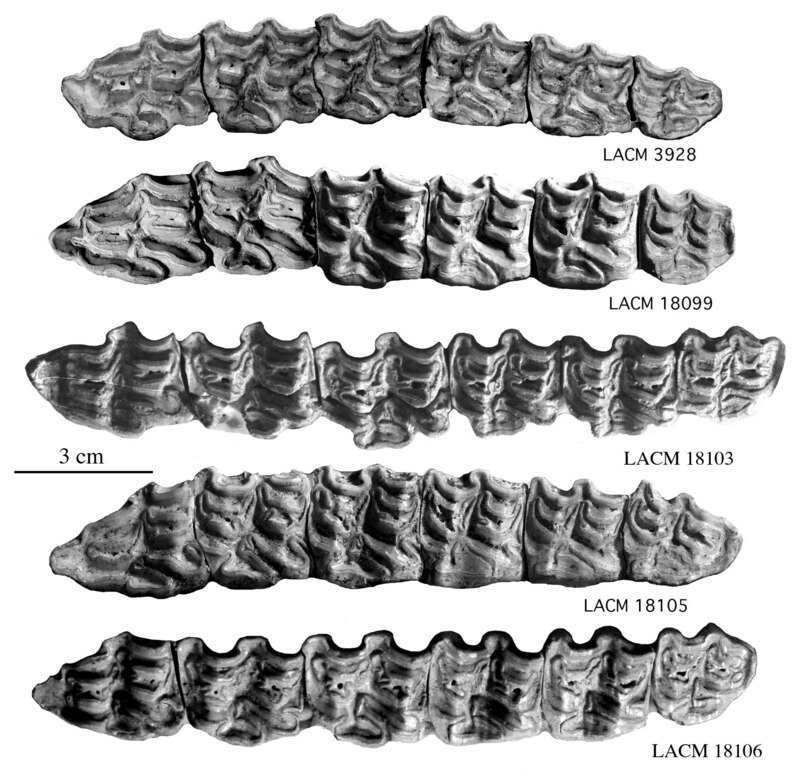 Dalquest & Hugues (1965) and Dalquest (1967) published figures and data of the fossils. The lower cheek teeth (Fig.26) are like other "E. conversidens". Some MT and Ph1 also (Fig.27, 28). 4. Blackwater Draw and Scharbauer (Quinn, 1957, Pl.III). Blacwater’s Ph1 are compatible with a small A. leoni (Fig.29 and 30). All data were kindly communicated by A.H. Harris. 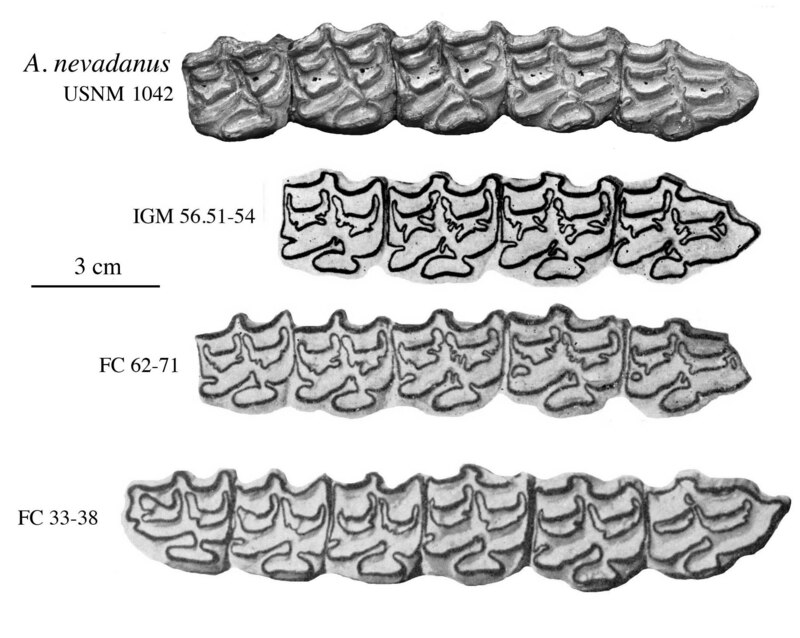 Several cheek teeth may be referred to "E. conversidens" (Fig.32, Fig.33). The symphyses are compatible with A. leoni (Fig.34). 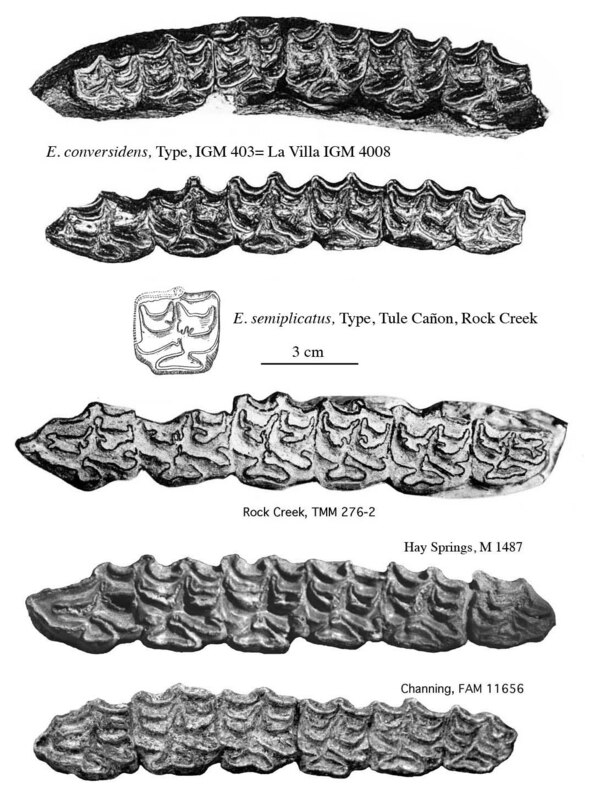 One MC may belong to "E. conversidens" ; two other are more like E. nevadanus and the specimen from Burnet Cave (fig.35). Several Ph1 may be referred to "E. conversidens" or A. leoni (Fig.36). 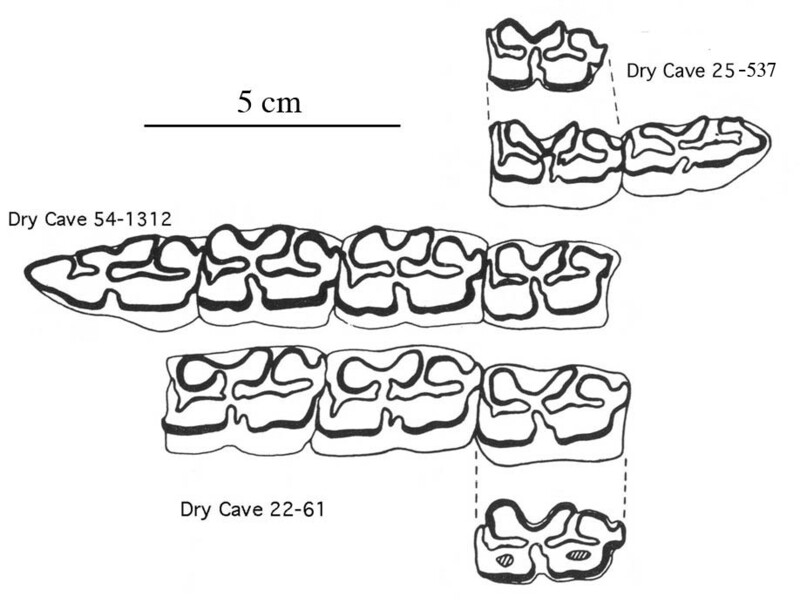 The lower cheek teeth series (Fig.37) may be referred to "E. conversidens". 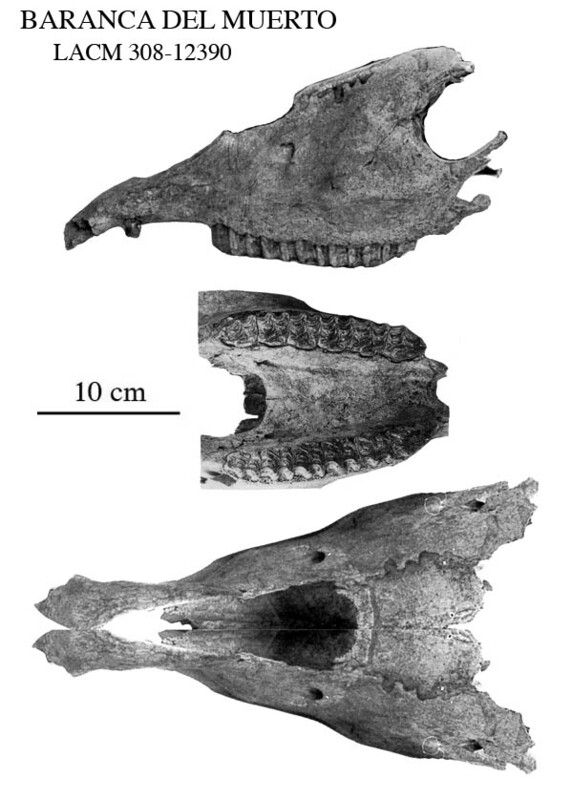 There is a fragmentary cranium of small size (Fig.38) that may possibly belong to a small "E. conversidens" (Fig.5). The protocone is short on the P3 but long on the molars (Fig.39). This species will be dealt in detail in the article on Natural Trap. On the whole, it resembles A. leoni. Azzaroli A., 1998. The Genus Equus in North America. The Pleistocene species. Palaeontographia Italica, 85 : 1-60, 21 pl. Dalquest, W.W., 1967.- Mammalls of the Pleistocene Slaton Local fauna of Texas. The Southwestern Naturalist, 12 : 1-30. Dalquest, W.W. & Hughes, J.T., 1965.- The Pleistocene Horse Equus conversidens. The American Naturalist. Notes and discussions : 241-244. Hay O.P. 1927. The Pleistocene of the Western Region of North America and its vertebrated animals. Carnegie Institution Washington Publications 332B, 1-346. Hibbard C. 1955. 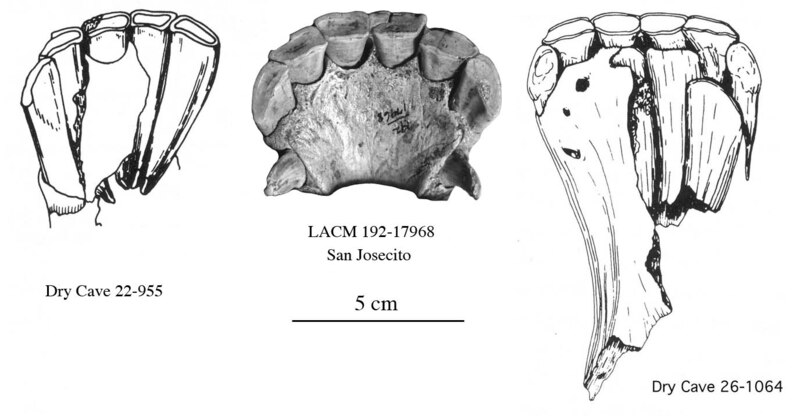 Pleistocene vertebrates from the Upper Becerra (Becerra Superior) Formation, Valley of Tequixquiac, Mexco, with notes on other Pleistocene forms. Contributions of the Museum of Paleontology of the University of Michigan, 12, 47-96. Mooser O., 1958. La fauna "Cedazo" del Pleistoceno en Aguascalientes. An. Del Inst. de Biologia Mexico, 29 : 409-573. Pichardo M. 2000a. Valsequillo Biostratigraphy III : Equid ecospecies in Paleoindian sites. Anthropologischer Anzeiger, 58 (3), 275-298. Pichardo M. 2000b. Redating Iztapan and Valsequillo, Mexico. Radiocarbon, 42 (2 ), 305-310. Pichardo M. 2001. Valsequillo Biostratigraphy IV : Proboscidian ecospecies in Paleoindian sites. Anthropologischer Anzeiger, 59(1) : 41-60. Pichardo M. 2003. Overview of Central mexican Prehistory : Morphostratigraphy, Chronostratigraphy, Biostratigraphy. Anthropologischer Anzeiger, 61(2):141-174. Pichardo M. 2004. Review of Horses in Paleoindian Sites of the Americas. Anthropologischer Anzeiger, 62(1) : 11-35. Pichardo M. 2006. Update of Equids in Paleoindian times. In Equids in Time and Space, Festschrift in honorem Vera Eisenmann, Mashkour ed., Oxbow Books. Quinn J. H., 1957. Pleistocene Equidae of Texas. Bureau of Economic Geology, University of Texas, Report of Investigations 33 : 51pp. Skinner M.F., 1942. - The fauna of Papago Springs Cave, Arizona, and a study of Stockoceros ; with three new antilocaprines from Nebraska and Arizona. Bulletin of the American Museum of Natural History, 8O (6) : 143-22O, 19 fig., New York. Winans M.C., 1985. 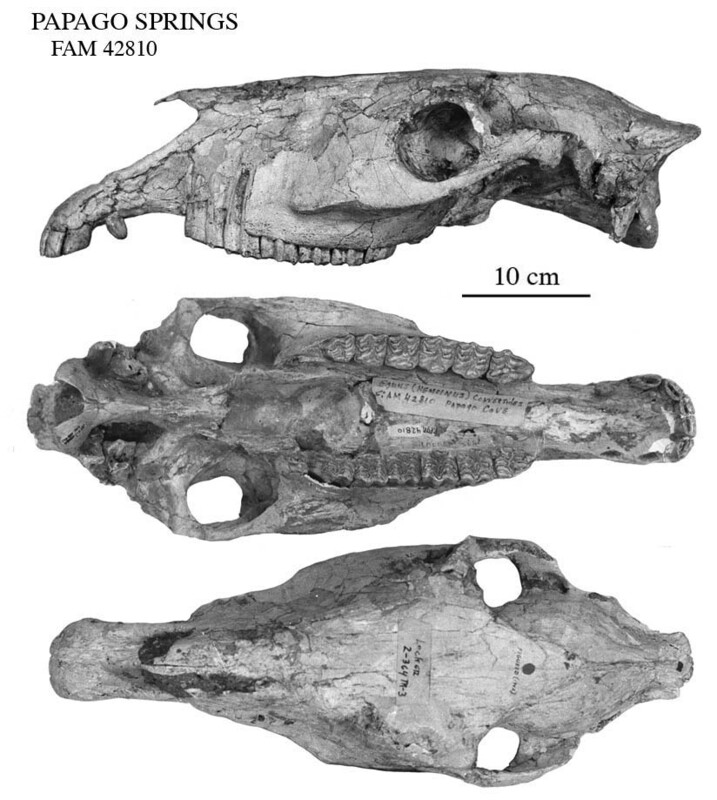 - Revision of North American fossil species of the genus Equus (Mammalia : Perissodactyla : Equidae). Dissertation, Univ. of Texas : 264pp., 26 fig., tables, Austin. fr Equidae monodactyles Equidés monodactyles fossiles (Equus, Allohippus, (...) Amérique du Nord, Amerhippus ?